James Harry Lacey was born in Wetherby, Yorkshire. In 1937 he joined the Royal Air Force Volunteer Reserve as a trainee pilot and then went on to take an instructors course in 1938. At the outbreak of war in 1939 he was 'called up' and joined the Royal Air Force, Squadron No. 501. 501 Squadron were moved to France in May 1940 and James had his first taste of combat. He destroyed a Heinkel He 111, a Messerschmitt Bf109 and a Messerschmitt Bf 110 on 13th May 1940. On the 27th May 1940, James shot down two more Heinkel He 111's. On 9th June he had to crash land his Hurricane in a swamp. He was awarded the Croix de guerre for his service in France. On the 19th June 1940, 501 Squadron were moved to England for the Battle of Britain. On 20th July 1940, James got his first Battle of Britain kill shooting down a Messerschmitt Bf 109E. On the 12th August he shot down a Junkers Ju 87, on the 24th August he shot down a Junkers Ju 88 and on the 29th August he shot down a Messerschmitt Bf 109. On the 13th August his aircraft was shot up and he had to bail out, fortunately being unharmed. 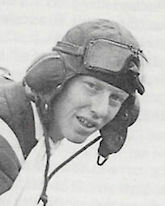 On the 23rd of August James Lacey was awarded the Distiguished Flying Medal (DFM). On the 30th August 1940, James shot down a Heinkel He 111 over London and received damage to his Hurricane's engine but rather than bailing out he managed to glide his striken plane to the airfield at Gravesend. On the 31st of August he shot down a Messerschmitt Bf 109. On the 2nd September 1940 James shot down 2 Messerschmitt Bf 109's and another 2 Bf 109's on the 5th September. On the 13th September he engaged a formation of Henkel He 111's and shot down one of them but had to bail out suffering slight injury. On the 15th September 1940 James shot down a Heinkel He 111 and 3 Messerschmitt Bf 109's, due to the heavy fighting this date went on to be known as 'Battle of Britain Day'. During a dog fight with Messerschmitt Bf 109's on the 17th September, James was shot down and bailed out. On the 27th of September he shot down a Messerschmitt Bf 109. In the month of October he shot down 3 more Messerchmitt Bf 109's, one on the 12th, one on the 26th and one on the 30th. James Lacey was awarded a Bar to his DFM on 26th November 1940 after shooting down 18 aircraft during the Battle of Britain and 23 to date. January 1941, James Lacey was commissioned and was promoted to Acting Flight Lieutenant later in June as 'A' flight commander. On the 10th July 1941 he shot down a Heinkel He 59 seaplane and on the 24th July he caused 2 Messerschmitt Bf 109'2 to collide in mid air. During August 1941 he was posted as flight instructor with 57 Operational Training Unit. In March 1942 James joined 602 Squadron at Kenley and was then posted to 81 group as Tactics Officer and later in the year as Chief Instructor at the No. 1 Special Attack Instructors School. During March 1943, he was posted to 20 Squadron in India and then 1572 Gunnery Flight in July. He stayed in India and was posted to 155 Squadron in November of 1944 flying Spitfires and then at the end of the month as CO of 17 Squadron. On 19th February 1945, James got his last kill shooting down a Nakajima Ki 43. After the war, James Lacey went to Japan with 17 Squadron and was the first Spitfire pilot to fly over Japan. He was posted back to England in May 1946 receiving a permanent commission and retired from the RAF on 5th March 1967 retaining the rank of Squadron Leader. James 'Ginger' Lacey died at the age of 72 on 30th May 1989.